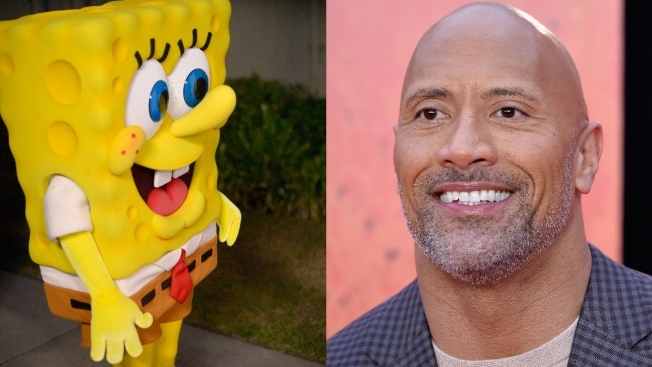 Who tweets at "the Rock" from a pineapple under the sea? SpongeBob Squarepants. Dwayne "The Rock" Johnson has a new friend on social media and he lives under the sea. SpongeBob Squarepants on Friday tagged Johnson in a tweet asking what inspired his nickname, since SpongeBob's friend Patrick lives under a rock. Johnson on Sunday asked did SpongeBob mean "Big Daddy? The Rock? Samoan Thor? Beef Piston? Or the inappropriate one" he earned in college. Johnson also wrote he loved SpongeBob's work. We earned one or two cool names ourselves back in boating school 😂. SpongeBob responded that he earned "one or two cool names" in boating school. He then asked if The Rock could smell what Bob was cooking. The answer: Krabby Patties.